The Shape of Water has swept the 2018 Oscar nominations with 13 noms, including Best Picture and Best Director. And Get Out didn't disappoint with noms for Best Picture, Best Director and Best Actor. Actress-comedian Tiffany Haddish and actor-director Andy Serkis, joined by Academy President John Bailey, announced the 90th Academy Awards nominations today (January 23) live from the Academy's Samuel Goldwyn Theater via a global live stream on Oscar.com, Oscars.org, the Academy's digital platforms, a satellite feed and broadcast media. Haddish and Serkis announced the nominees in 11 categories at 5:22 a.m. PT, with pre-taped category introductions by Academy members Priyanka Chopra, Rosario Dawson, Gal Gadot, Salma Hayek, Michelle Rodriguez, Zoe Saldana, Molly Shannon, Rebel Wilson and Michelle Yeoh. Haddish and Serkis announced the remaining 13 categories at 5:38 a.m. PT. At 5:22 a.m. PST, the nominees were announced in the following categories: Cinematography, Costume Design, Film Editing, Makeup and Hairstyling, Original Score, Production Design, Animated Short Film, Live Action Short Film, Sound Editing, Sound Mixing and Visual Effects. At 5:38:30 a.m. PST, the nominees will be announced in the following categories (listed here in no particular order): Actor in a Leading Role, Actor in a Supporting Role, Actress in a Leading Role, Actress in a Supporting Role, Animated Feature Film, Directing, Documentary Feature, Documentary Short Subject, Foreign Language Film, Original Song, Best Picture, Adapted Screenplay and Original Screenplay. Some of the big nominations in all categories went to Three Billboards Outside Ebbing, Missouri, The Post, Lady Bird, Darkest Night, and Call Me by Your Name, Dunkirk and Phantom Thread, all of which garnered Best Picture nominations. When it all was said and done, Guillermo del Toro's The Shape of Water lead the way with 13 nominations, followed by Christopher Nolan's Dunkirk with eight nominations and Three Billboards Outside Ebbing, Missouri with seven nominations. Get Out filmmaker Jordan Peele became just the third filmmaker in Oscar history to receive nominations for writing and directing for his first feature film as a director. That feat was only accomplished by Warren Beatty for Heaven Can Wait (1978), nominations which he shared with Buck Henry, and James L. Brooks with Terms of Endearment (1983). Greta Gerwig also became just the fifth woman to be nominated for Best Director, followed by Lina Wertmüller for Seven Beauties (1976), Jane Campion for The Piano (1993), Sofia Coppola for Lost in Translation (2003) and Kathryn Bigelow, who won the award for The Hurt Locker (2009). Meryl Streep also extends her record as the most-nominated performer ever with 21 nominations with her nod for Best Actress for The Post. Academy members from each of the 17 branches vote to determine the nominees in their respective categories - actors nominate actors, film editors nominate film editors, etc. In the Animated Feature Film and Foreign Language Film categories, nominees are selected by a vote of multi-branch screening committees. All voting members are eligible to select the Best Picture nominees. Active members of the Academy are eligible to vote for the winners in all 24 categories beginning Tuesday, February 20 through Tuesday, February 27. 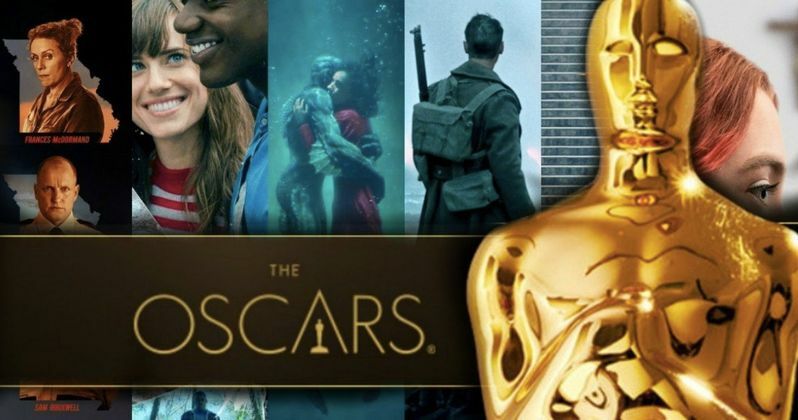 The 90th Oscars will be held on Sunday, March 4, 2018, at the Dolby Theatre at Hollywood & Highland Center in Hollywood, and will be televised live on the ABC Television Network. The Oscars also will be televised live in more than 225 countries and territories worldwide. Here is the full list of winners.